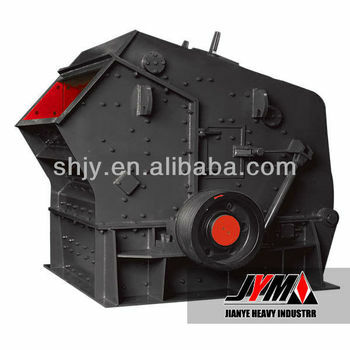 Impact crusher can process granite,basalt,limestone,etc,which the granularity is not bigger than 120-300mm and crushing compression strength is not more than 320mp. It is used in both primary and secondary crushing applications of aggregate, and in recycle crushing of reinforced concrete, asphalt and other construction and demolition debris. This cube shaped fineness product is the first-class device used in high grade road surface,railway,water conservancy and electricity industry. 3) It is convenient for maintenance. Shanghai Jianye Heavy Industry Co.,Ltd is an an international enterprise which expert on design ,manufacture ,sales ,and service of the stone crushing,sand making and grinding machines.The products are widely used in railway, highway, water conservancy and hydropower engineering construction projects.Company has successfully provide high-quality crushing,sand making ,screening plant, grinder mill equipments for many projects. SHJY office is located in Shanghai, enjoying convenient transportation and beautiful environment. Forming a special R&D team, import, absorb and assimilate advanced technical both abroad and domestic.We will supply much better products with diversified designs and professional services. Till now, our products are sold to more than 100 countries, being the popular equipments in global crushing and grinding industry. We sincerely welcome friends from all over the world to visit our company and cooperate with us on the basis of long-term mutual benefits. Our company has reliable products and experienced service team, give our clients the latest products information and technical service, we belive you not only need th eproducts, but also a good after-sales service.Based on the technology and quality products, we whould provide the gratified service for our customers. (1)Guide our customers to deploy the nost useful equipment item according to their requirment. (2)Provide technocal date, including machines list, base specification and installation picture. (3)Design and manufacture product according to the clients' special requestment. (4)Dispatch the tngineer to site and design the best installtion flow and scheme to customers for free. SHJY factory covers an area of 40000M3 square meters and has 200 employees. High standard strict challenge,good brand are our quality idea. Our workers set up the quality control system form the raw material to the processing of manufacture, carry out “making brand with good quality all the time and promoting brand with nice service”. Till now, our products are sold to more than 100 countries, being the popular equipments in global crushing and grinding industry. SHJY company has reliable products and experienced service team.We believe you not only need the machines, but also good after sales service.Based on the technology and quality, we would provide a gratified,save worry and disburden service for you. we can fully satisfy your demands and have a large customer base. Our products sell well in _Morocco,_Iran, Kazakhstan, Uzbekistan, Kyrghyzstan, Russia, India, Indonesia, Thailand, Philippines, Korea, Yemen, Kenya, Mongolia, Nigeria, Vietnam_. Except our own products, we provide OEM services and accept customized order as well. In the development of SHJY, we always faith to business purposes:”integrity and pragmatic, scientific and technological innovation”, provide to our customers with a good reputation,excellent quality,cheaper price,prompt delivery system.